There is something wanton, somehow, about ivy taking over a place. Something licentious, a sense of all the traditional borders of life being flagrantly transgressed, of Ms Nature staring at you strong-eyed and lewd despite the best window frames man can construct. I used to duty manage a theatre complex in a great old house. The studio theatre was housed in the old nursery, a vast, high ceilinged room now a sanctum to the acting profession. They all said it was haunted. Some had inadvertently seen the two spectral occupants, the two children tragically killed in a nineteenth century fire. The actors had painted it matt black: black looming walls, black ceiling, even the gorgeous old shutters were black; and the room spent its life in darkness, subject to thespian fantasy after thespian fantasy. So it was that I had been at the theatre a year, locking that room up last thing at night, opening it as the hum of theatregoers agitated it back into life, when I spent some time milling around in the room with friends. Look, a techie said, pulling away the shutters of the tall window farthest away from the door. And I looked, and what I saw was inexplicably profane. For the glass had gone, strong-armed away by the ivy. It had crawled in, infinitely slowly, through the cracks and broken the glass and filled the violent void it had created, silently, by increments. and now it blocked the window completely, leaving the gap airless and lightless, except for the odd chink where the sunlight from outside dared to tiptoe. A stones throw from Jamaica In in Cornwall stands my sister in law’s cottage. Situated in the village of Northill, where Daphne Du Maurier’s magistrate was said to reside, it is built from blocks of stone hewn from the moors. And when I first came to see the cottage, some 20 years ago, the cottage was comfortable with its surroundings, nestling in the hills which gaze up to Kilmar. But the ivy was coming. Beside the fireplace, behind the television in the sitting room, it was sneaking through the mortar in the stone-block wall, curling its fronds, sizing up its next move. John Wyndham knew what he was talking about, when he devised triffids. Some plants: they have a knowing quality. And there are few of us whose lives have not been touched by ivy, one way or another. Posted in WhimsyTagged anglophile, chiller, england, gardening, ivy, plants, spookyBookmark the permalink. You’re right, Kate, Nature — whether in its evolved or genetically modified form — has a way of waving two fingers at us. If it’s not ivy it’s wisteria, as in our old house in Bristol, which though beautiful was breaking up the ground near the facade’s foundation. Or introduced invasive species, bully boys like Himalayan balsam or, worse, Japanese knotweed: these are the real triffids knocking at the doors of old Welsh farmhouses near us. Not ours though. Yet. I didn’t realise wisteria had the same properties, Chris. It always looks so ingenuously charming on buildings. I shall remember its darker side next Spring during its flowering. Good luck, Solveig. It always gives me the creeps clearing ivy! It is the only way to describe it, Gabrielle. I confess, I had never seen anything quite like it in a big old house. beautiful piece kate, and ivy has a way of guiltlessly claiming what it feels it owns. It does. Nature always wins in the end! Well, this is strange. Today I stopped at the entrance to the city garage in which I had parked to contemplate a creeper (not ivy, but similar) which had grown over the walls to the entrance, and it brought to mind both my mother and my maternal grandmother. 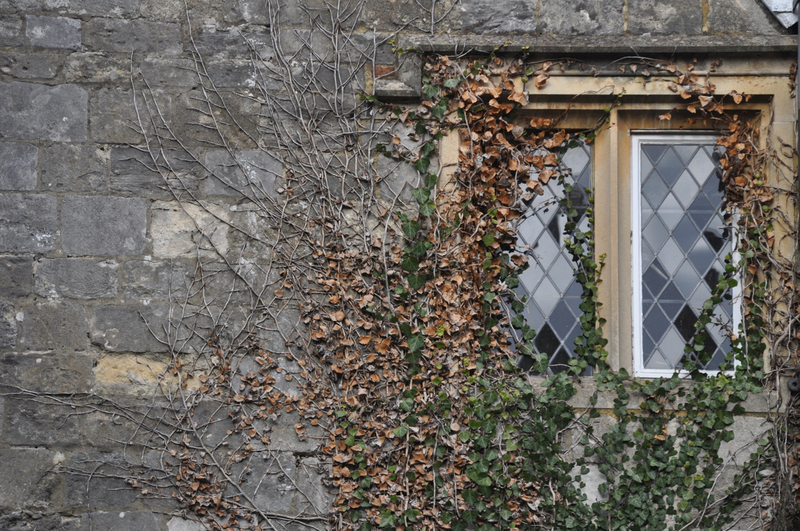 The former has, since I can remember, expressed the desire to live in a stone-wrought home covered in a tangle of ivy, while the latter wouldn’t even keep an amaryllis, given her as a gift, in her bedroom, lest it bite her in the night. Your maternal grandmother sounds a wise woman! Creeper. The word says it all! I have a love-hate relationship with ivy. When we bought our 1915 farmhouse eight years ago, it was overrun with the most aggressive sturdy ivy I’ve ever seen. It actually was so old it had trunks. And it fought desperately for its life in the places where we removed it, coming back year after year. When we renovated the kitchen and pulled out the sink cabinet, we found ivy growing up through the siding and into the house. So now it adorns my containers only. Beautifully written piece, Kate. Thanks, Silver 🙂 Ivy with trunks sounds sinister in the extreme! You have had quite a battle on your hands! This post reminds me of Kudzu erasing entire Southern landscapes under a blanket of green. Or Virginia Creeper enveloping tree limbs and leaves in a femme fatale hug. Femme fatale. You have summed it up perfectly just there, Nancy. We used to have creeping fig growing on our front steps. Nothing would kill it. I hacked it back to nothing multiple times. We pulled it out by the roots. Ivies are plants that haunt us, surely, because they come back from the dead again and again and again. They do, Andra, you are so right: they are almost revenants. There is something of the zombie about them. Aha! I knew they were triffids, disguised as creeping charlie! They’ve invaded my garden plots. I weed. Yes, I weed, pulling them by their long legs, thinking I have them out, but, not. They are just waiting for me to turn my back and out them come again under the cloak of darkness. Sigh. The deer, alas, eat the ivy off the bricks on the house, though there is a patch on the second floor that they can’t quite reach . . .
You captured my imagination with this piece Kate. Absolutely tantalizing writing! The best writing always comes out of our experiences, doesn’t it, Hope? Hope all is well with you. Very poetically told tale, Kate. It prompted me to look out my window at the creeping vines that have crawled up the back of my brownstone for decades. The walls are smooth with naked brick. It appears that Building Management has invested in some type of Weed Be Gone on steroids. Every summer, wildly growing vines would overtake my windows. Maybe this summer will be different, but it is very early in the season. Vines at the window in New York. Somehow, that sounds nice. And it must provide shadow and a little cool in the hot days of Summer? 😀 Indeed. It can only be a matter of time, Jackie. Your ivy sounds as if it was really entrenched, Karen! A fortunate house indeed. it must have heaved a sigh of relief when it saw you coming. Insolent fronds. Makes you want to get the flame-thrower out, were it not for the fact that the ivy holds the house hostage. Terrific post! My house and I grapple with two insinuating vines: Virgina creeper, which came out of the wilds on its own to take up determined residence in the garden, and trumpet vine planted by the former owner. The trumpet vine is beloved by the hummingbirds, and is lovely, but it stretches stealthily up the house and across the roof to look in the bedroom windows. I make a trip out on the roof at least twice a summer to battle it. Ivy is often depicted as a destroyer and a parasite. Yet I recall having read about an oak/ivy partnership going back over 300 years. If that ivy is destroying the oak, it certainly is taking its time about it! Maybe ivy isn’t too fond of bricks or glass, though. Excellent point, a perfect piece of devil’s advocacy, Col.
Of course, it does do a good job of housing the creeps, too – that is to say, creepy creatures. We had virginia creeper on one of the houses in France….though we tried to keep it in check it was always a surprise to look out of a bedroom window to find it had managed to frame it while we were not looking…and it managed to enter the house through the understairs cupboard….but it was too lovely to take down….and anyway it would have come back….it was a survivor! Helen, I had no idea the virginia creeper was so vigorous. What a riot of colour that must be in Autumn!